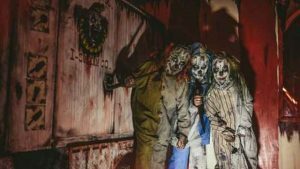 Fright Kingdom is one of the best and closest Halloween attractions in New England, and it’s especially a treat on a rainy night. I do love being outdoors, since walking through the woods of New England at night is automatically scary, but on a rainy night, you don’t want to visit a farm or woods walk or corn field maze. 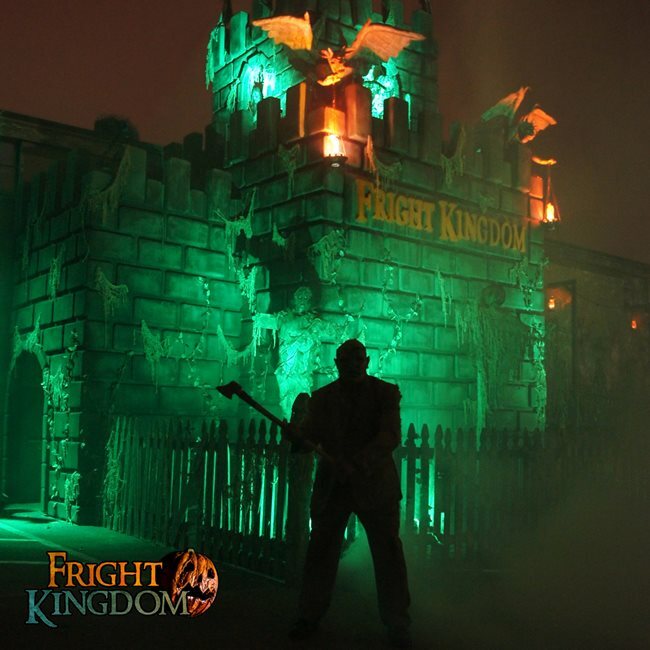 You want to visit Fright Kingdom, located in Nashua, New Hampshire, less than an hour’s drive from Boston. You can spend an entire evening in the attraction. Even in the entrance, actors will spook you while you’re waiting in line, and you walk through a tunnel with live snakes and spiders behind glass. Instead of waiting in a long line, get a time slot so that you can enjoy the Monster Midway, a non-scary central play area, which is extensive. They have a live DJ with performances on stage. You’ll find two “escape rooms” where you get locked in a room and solve puzzles to escape. Take photos at the horror movie museum or buy memorabilia and Halloween clothing and posters. They have plenty of food including ice cream, yogurt, cotton candy, and hot dogs. Then walk through the main attractions, the brainchild of owners Tim & Angela Dunne. They run a demolition business, so when they are taking down a building, and find weird stuff — it gets painted scary and goes into Fight Kingdom! That’s the secret behind the strength of the staging, which is original, scary, and theatrical. I love the “Vortex”, an illusion walkway that makes you feel like the whole room is spinning. You walk through the main five attractions sequentially, adding up to about 30 minutes. Animatronics, some of them sensational, are everywhere. Watch out for the pressure mats and jets blowing air to startle you! One favorite has a live actor bouncing in on bungee cords. While some Halloween attractions make an effort but end up with generic costuming and makeup, such as Witch’s Woods and Spooky World, at Fright Kingdom the costuming and makeup are unique. Actors know just where to stand, and a few had real lines to say or scenes to act out. The attraction is nearly but not quite perfect. I did enjoy the blackout area, though as you feel your way along the walls there are electric shocks to startle you that are too strong for me. I’m not a fan of squeezing through a super-tight balloon passage, which you’ll find at many attractions, maybe because I’m such a big guy, and I always wonder what previous visitors have left behind there. In the 3D maze, they give you glasses and you walk through a plywood maze, but the random paint splatters and clown murals don’t let you suspend disbelief as though you’re in a real building, and contained some filler where you’re just pushing through a lot of hanging cloth barriers. 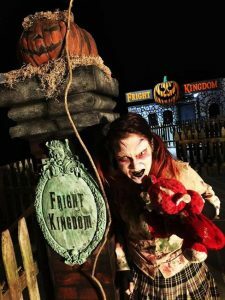 But really I could not recommend Fright Kingdom more highly, and they are the only attraction in New England that has Christmas and Valentine’s Day scares in December and February. How delightfully frightful! You’ll also find a kids-friendly “Hardly Haunted” day on October 29 in the afternoon. With innovation only rivaled by a few, Fright Kingdom is on my short list of best Halloween attractions in New England — and should be on yours too! 5 stars.